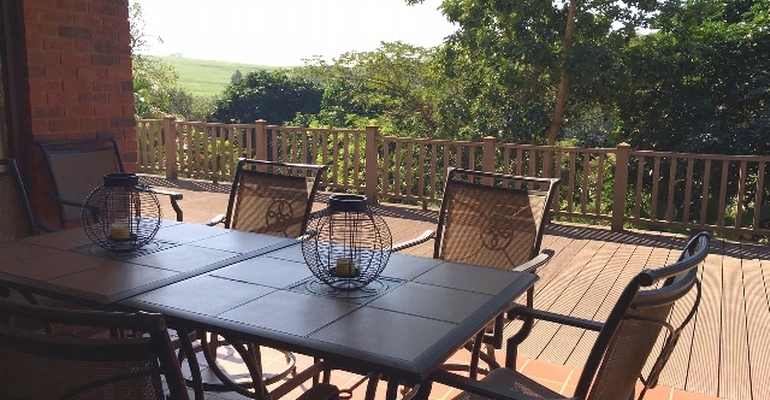 Marula Mews, situated in Selborne Park Golf Estate, offers guests a holiday of tranquil luxury and is perfect for small family or a romantic couples vacation. The furnished, undercover veranda at the front of the house has a built-in braai area with easy access to the kitchen and enjoys spectacular views of the natural vegetation encompassing the Golf Estate. The back of the house has a secure lock-up garage for guests use. Large sliding doors allow for ample sunshine into the open plan lounge which leads out onto the veranda. Modernly furnished with comfort in mind, the lounge has a large flat screen TV with full DSTV bouquet, so guests never need miss those favourite TV shows or important sporting events. The dining area has a 6 seater dining table situated adjacent to the fully equipped kitchen for easy catering. The main bedroom is en-suite, has built in cupboards and a flat screen TV with DSTV. A spacious guest bedroom with double bed has built in cupboards and side tables. Guests staying at Marula Mews are invited to make use of the fabulous facilities at Selborne Park Golf Estate. Aside from the immaculate 18-hole golf course there is also a swimming pool, tennis courts, children’s play area and a restaurant & bar where delicious meals can be enjoyed daily.